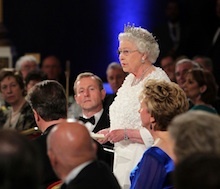 Donning her royal tiara for the evening, Windsor spoke imperiously at a sumptuous banquet in her honour at Dublin Castle, the traditional seat of British power in Ireland. There had been reports that an effort would be made by Windsor’s speechwriters to deal with Britain’s appalling legacy in Ireland. But these were dashed when she only offered her “sincere thoughts and deep sympathy” to those who had suffered in the troubles, a category in which she included herself. Despite being cushioned in soft tones and feel-good rhetoric, it was a bitter disappointment to those who had believed that the visit might witness the British government accepting some responsibility for its misdeeds and move to redress the historical injustices. However, it was no coincidence that all of the major Irish media players were among the small coterie of elite guests invited to the banquet. After years of preparation for the visit by public relations experts, political spin-doctors and media lackeys, there was a major effort to use the visit to draw a veil over the past and claim an end to the conflict over the partition of Ireland. But in the end, the speech, like the rest of the visit, was blown wildly out of proportion and media coverage of the visit began to take on a hysterical, imaginary quality. Even 26-County President Mary McAleese was forced to feign shock and awe at the ability of the British monarch to utter the Irish word for President as she addressed her audience, which was then touted as a major breakthrough in Anglo-Irish relations. And at the end of the speech, when Mrs McAleese’s breathless “thank you” to Windsor’s toast elicited the Forrest Gump-like response: “I like clinking glass”, gushing television commentators and social media spin doctors again eulogised about Windsor’s “wonderful spontaneity”. Outside, in the reality of a cold and damp night in Dublin, protestors were kept corralled and far out of sight, silenced by an overwhelming police presence and old-fashioned censorship. There was therefore little to the check the media hysteria, which continued relentlessly all week. It took on the extraordinary goal -- particularly in the British media -- of not just bringing an end to Irish nationalism, but of ending all distictions between Irish and British identity. Amid a confusing battery of symbolism and choreographed events, accompanied by more breathless analysis and adoring commentary, the professions of love for ‘our Queen’ approached the levels of a public brainwashing. It was “a day when the power of music and memory and mythology fused and sparked and swept us up in its dignified embrace,” according to one excited Irish Times journalist, among reams of similar fare. The visit by Windsor to Croke Park, the home stadium of the Gaelic Athletics Association and the scene of one of Britain’s worst massacres, was disturbingly choreographed and propogandised. “No-one mentioned the war, Bloody Sunday, or the fact that the GAA still has refuseniks in its ranks,” a more sceptical journalist wrote, obliquely referring to the fact that all but one of the nine Ulster county representations boycotted the monstrous event. In an ‘unthinkable’ faux pas, one ex-president of the GAA guided the monarch by the elbow before his hand was pushed aside by one of the British protection officers. There was also an absurd incident at St James’s Gate, where Windsor and her partner stood well back from a pint of Guinness which apparently had not been cleared by the royal tasters. Despite considerable public disdain for the upheaval caused by the visit, the extreme pro-British Independent News and Media group revelled in the royal publicity bonanza. It mocked the various republican organisations involved in protests and claimed that the visit would be the death of “dissident republicanism”. Most of the political statements were hopelessly disjointed, almost all in the vein of conservative unionism, and some involving elements of escapist fantasy. Sinn Fein President Gerry Adams maintained a heavily nuanced position on the royal visit, but allowed that Windsor’s expressed sympathy was “genuine”. “The import of the Queen of England’s remarks tonight will be judged by the actions of her government in the time ahead,” he said. “I believe that her expression of sincere sympathy for those who have suffered as a consequence of our troubled past is genuine. He pointed out that the statement about the relationship between Britain and Ireland not being ‘entirely benign’ was “a gross understatement”.